I'm Joanna, a mum of two small boys in Perth, Western Australia. I have a graphic design and marketing background and a passion for all things related to interior design. When I left my corporate job to stay at home with my children, I started making cushions and other soft furnishings for myself, friends and family. 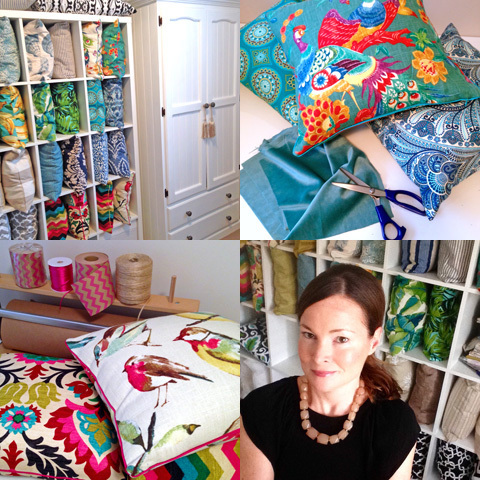 I became addicted to soft furnishings and decided to start Pear Tree Home to share my love of cushions with others. I love creating beautiful living spaces and my aim is to help my customers create their own beautiful spaces, which reflect their personalities and their creativity. I am a self-confessed cushion addict and I design and make cushions in a range of styles and colours. I love rich colours, intricate patterns and beautiful textures. Velvets and antique-style linens are some of my favourite materials. My style is quite classic, but with a colourful twist. I love designs based on nature – birds, feathers, botanical prints – and I also have a thing for classic stripes and damask prints. I design my cushions in collections, with colour and texture being the elements that tie my collections together. I read a lot of interior design magazines and go to lots of interiors stores. I like to look at interior trends and interpret them within my own, quite classic style. I aim to design pieces that are inspired by trends, but have longevity and are easy to incorporate into homes. I am constantly trawling through fabric stores, ordering sample swatches, trying things together to see what works as a collection. Then I buy my fabric, excitedly await its arrival, and sew! I am constantly surrounded by fabric swatches, samples and trims, and I’ve been known to creep into my studio at 2 in the morning to try out a new combination! I have been making things and crafting my whole life, ranging from drawing, painting and sewing clothes, to designing interiors and managing renovation projects. I have been sewing soft furnishings for a couple of years, but started Pear Tree Home officially at the start of 2015 when my oldest child started school. I have a very crafty mother who is a talented clothes designer and seamstress and she taught me to sew from an early age. I remember following her into fabric stores as a child and just loving the colours and feeling the beautiful textures. There’s no deep story here – I just love pear trees and I love classic style, so the name Pear Tree Home just worked for me! It evokes an image of a classic cottage with pear trees out the front, and I guess that encapsulates my style in a lot of ways. I love trawling through local interiors stores – there are so many talented designers in Perth and their work inspires me. I also enjoy following talented designers on Instagram – architects, interior designers and landscape designers. With two small children, I don’t have a lot of time to go to classes, but when I need to learn new skills, I tend to turn to YouTube – it’s amazing what you can learn online these days! It’s an oldie, but a goodie: Do what you love and what you are passionate about. I know it’s not always that simple, as mortgages and bills need to be paid, but it’s amazing what you can achieve in a few hours at night and, if you do a little bit of something you love every day, you really can make it go somewhere. If you love it, it won’t feel like work. Nothing feels better than making a business from doing something that you are really passionate about. Use all of the resources that you’ve got available to you (contacts, local shop owners, etc.) and the online tools you’ve got access to and get your products out there. If you love what you do and you create high quality, beautifully-made products, like-minded customers will start to come your way. For many of us, it’s really frightening to put yourself and your products out there, but you’ve got to take that leap of faith – it will pay off. Know your style and be true to it. When I first started, I purchased a few fabrics that were on-trend, that I thought customers would like, but that I wasn’t really that into myself and - surprise, surprise - they didn’t sell! My most successful designs have been those that are really true to my style. I am a full-time mum to two very mischievous and creative little boys, aged 2 and 4 and I have a wonderful husband who is working FIFO. That doesn’t leave me with a lot of time for anything else, but I do love to cook, read and garden. I am also a serial renovator and love the challenge of transforming an old and tired space into something beautiful and functional, while retaining and enhancing its original charm and character. On TV, I love Grand Designs – it’s my favourite late-night indulgence! Online, I really enjoy Houzz and I’m addicted to online fabric stores. Instagram and Facebook are also very important channels for my business, so I spend a bit of time on each of them. And I always enjoy trawling through Made It looking for great gifts and ideas. A morning swim and breakfast at a beach café with my husband and boys, followed by a few hours in my studio to sew, create and dream. HarlequinFox - I am currently lusting over their beaded necklaces – they’re beautiful, stylish, practical and child-proof!